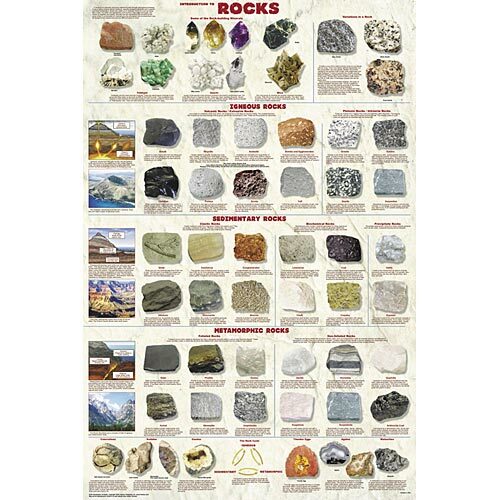 Ideal for geology classes and collectors, this highly descriptive chart is also a helpful resource for identification. The chart explains how rocks are made of minerals and that each type of rock is the result of a specific mixture of minerals subjected to a clearly defined geological process. A section is dedicated to each type of rock — igneous, sedimentary, and metamorphic — with an illustration showing how they are made. A dramatic photograph also shows a natural formation, while additional photographs highlight a dozen representational specimens. A bonus section shows and explains some of the more specialized and popular rock forms such as geodes, concretions, agates, and thunder balls. Laminated.